When you order “to-go” you have more options now. Compostable To-Go Containers are available in Owens Food Court, Hokie Grill, Turner Place, and West End Market for your to-go meals. All large, 9 inch compostable to-go containers cost $0.20 cash/ $0.10 flex to use. 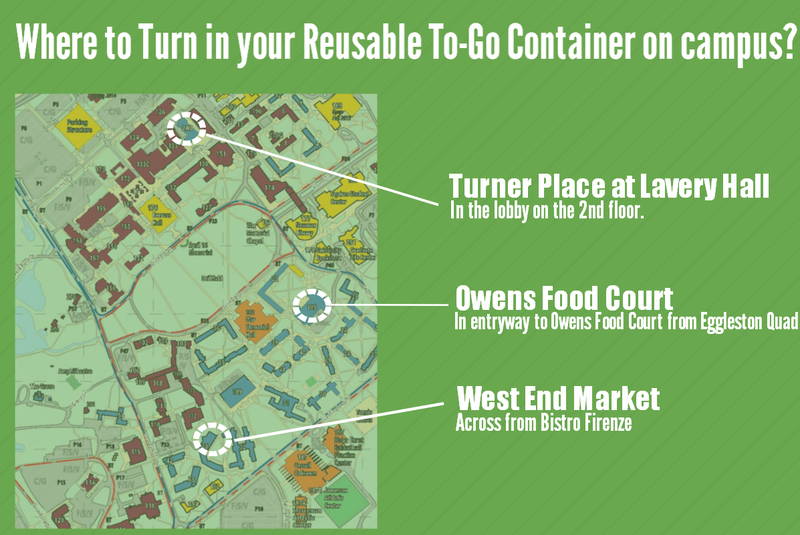 Reusable To-Go Containers are available at Owens Food Court, Turner Place and West End Market. For $3.50, buy-in to the Reusable To-Go Container program and use this program your entire college career and you save $0.20 cash/ $0.10 flex every time you use it. Remember to ask for your meal in a Reusable To-Go container when you order and buy in or hand over your token to the cashier. All Reusable To-Go containers should be returned to one of our three OZZI machines located in the units where we offer the program. 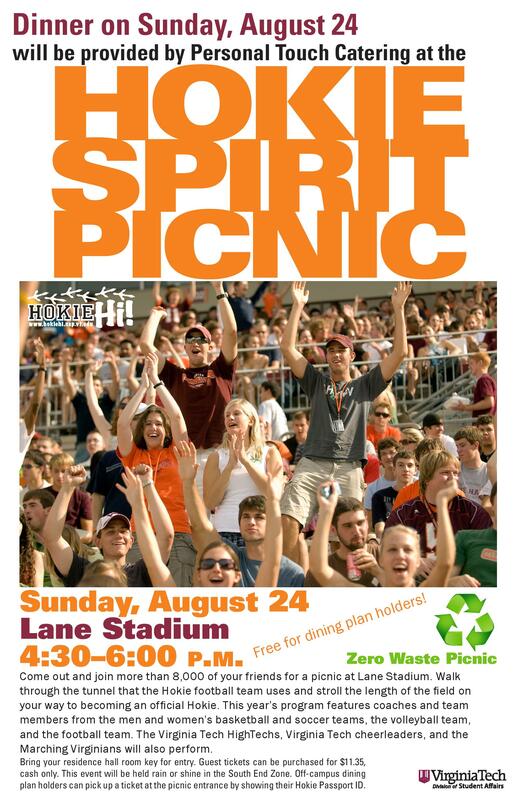 Volunteer for the Hokie Hi Picnic! Volunteer with us this coming Sunday 8/23. Spend your Sunday afternoon in Lane Stadium welcoming incoming freshmen and promoting sustainability on campus! There are two shifts available on Sunday, set up and clean up, respectively. Volunteers will be able to eat at the event and are encourage to work both shifts, if able. Please follow the link below to sign up! Volunteers from 2014 Zero Waste Welcom PIcnic. This could be you! Everything else in the compost! Let’s make this year’s picnic just as much of a success! Celebrate Earth Day with a fresh, local tomato. 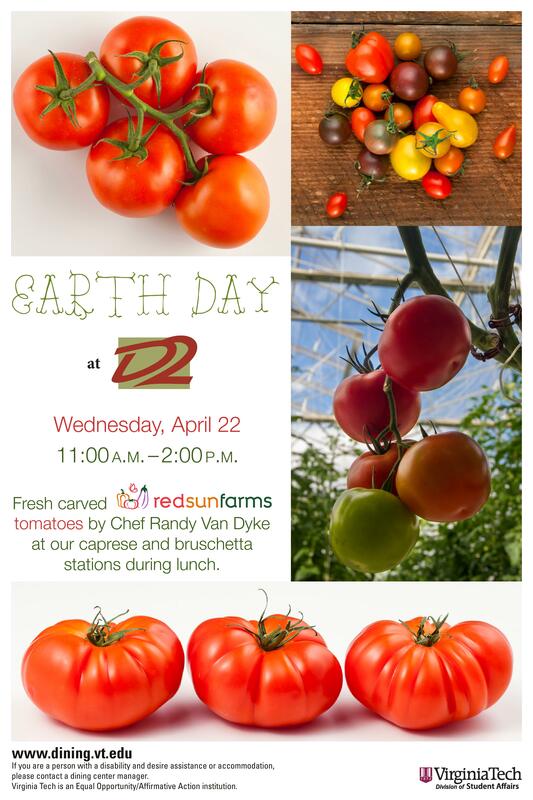 Visit D2 for lunch this Wednesday,EARTH DAY, April 22 for our local tomato caprese station. We’ll be serving a variety of tomatoes grown just a few miles down the road in Dublin, VA at the Red Sun Farms greenhouses. 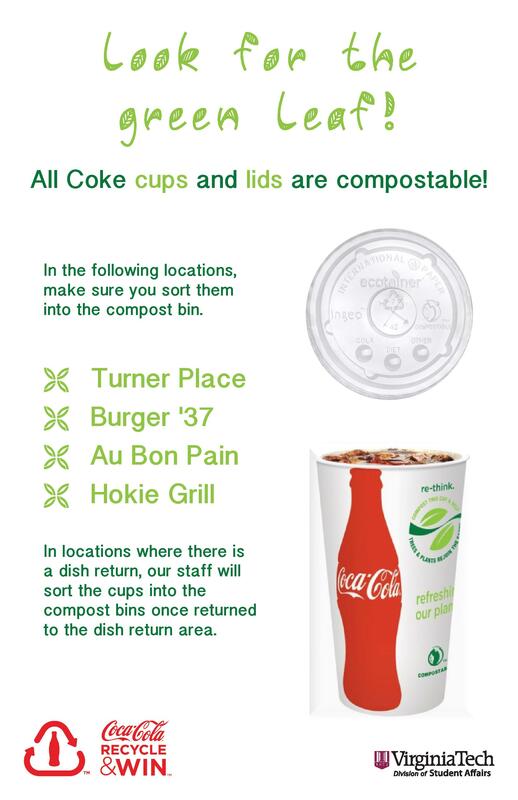 With the start of a new semester, brings a new inititative from VT Dining Services: Compostable To-Go Containers. These containers replace all foam clamshell containers in the units. You will find these containers at Owens Food Court, Hokie Grill, West End Market and Turner Place. Please remember to order “for here” when you’re eating in and return your compostable to-go container to the compost bins in our dining units. Compostable To-Go containers can be returned to the following locations. 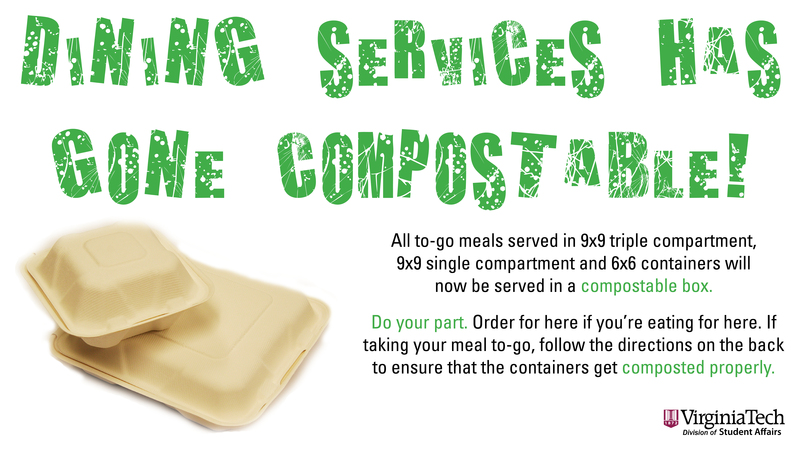 Announcing the start of a long term relationship with compostable to-go containers! 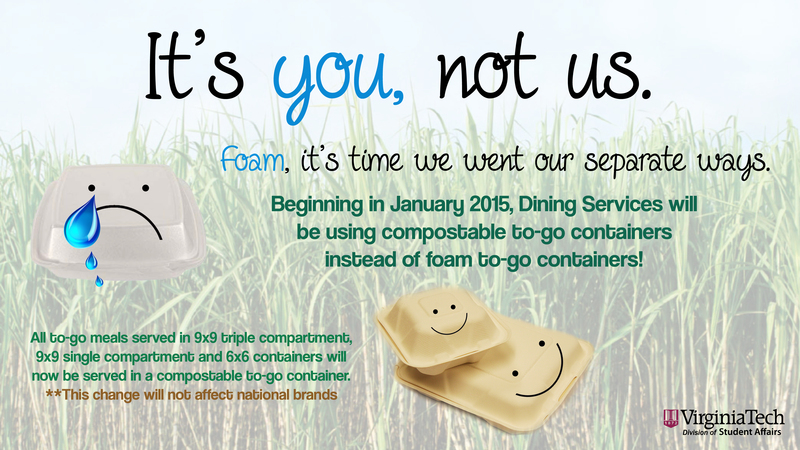 Starting January 2015, Dining Services will be replacing select foam to-go containers with compostable to-go containers. What should you expect from this transition? All meals currently served in 9×9 single and triple compartment and 6×6 foam containers will be switched to compostable containers. Note: National brands will not be impacted by this transition. The compostable to-go containers are made out of Bagasse which is a byproduct from the process of refining sugar from sugarcane. The crushed sugarcane stalks, which are normally disposed of by burning, are taken to a processing plant where they are converted into paperboard which is used to make these compostable containers. When you’re done with your compostable to-go container, please return to any dish return or compostable bin in the dining units. What’s New with Dining Sustainability this semester? Dining Services spent 12.9 % of its food and beverage budget on local food last academic year. This is an increase from 10.8% in 2012-13. 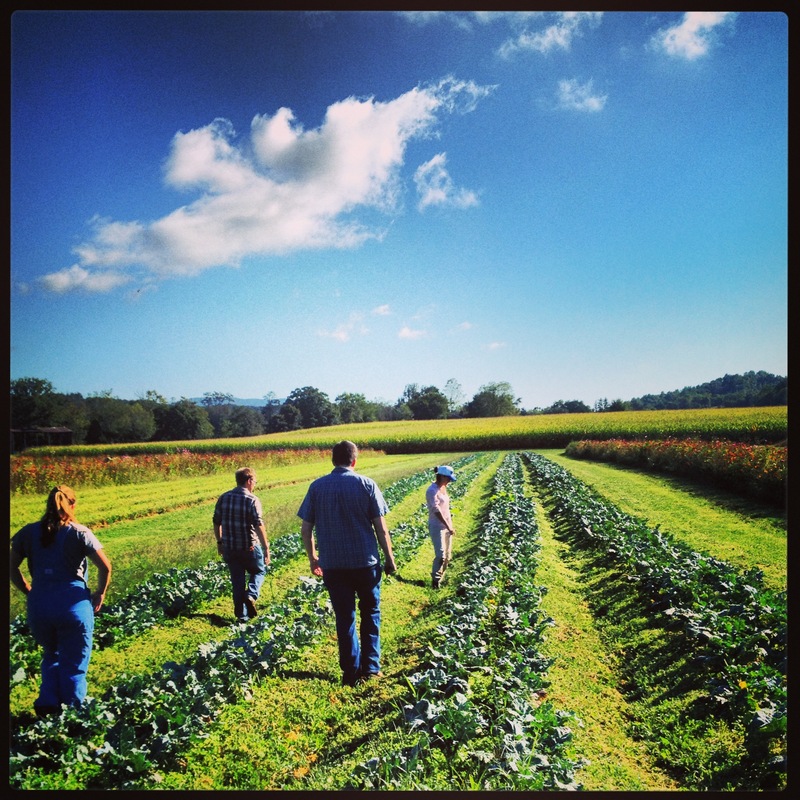 Our Farm Manager, Alex Hessler, is teaching a course this Fall on Small Scale Sustainable Farm Management. He already has 13 students enrolled. Consider adding the class to your schedule (Hort 4984)! The Hokie Hi Welcome Picnic will be serving local watermelon from the Dining Services Farm, all 1600 lbs of it! This year, Dining Services has a new Reusable Water Bottle for sale in most of our units. The water bottle can used for water and customers can get a discount on soda when presented at the register in participating units (see full list here). 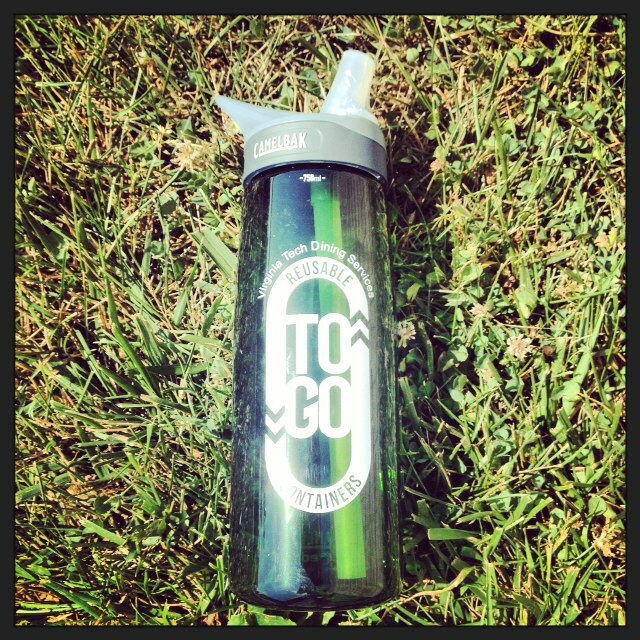 New Reusable Water bottles available for purchase this Fall. 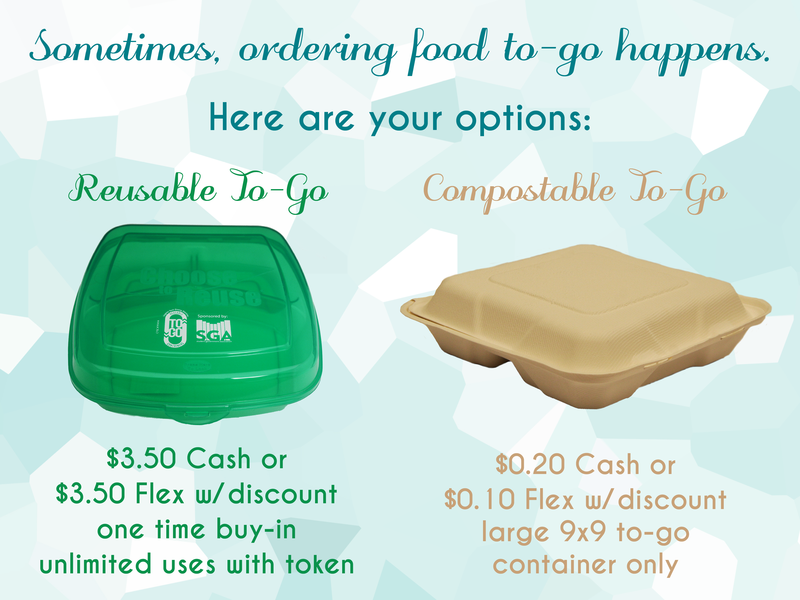 Pay $3 cash or $6 flex for use of a Reusable To-Go Container when ordering food. When finished with the container, return the container to the Ozzi machine located next to the kiosk in WEM, and receive a token. This token can then be handed to the cashiers at WEM for the next time they would like to order in a Reusable To-Go container. All Coke cups are now compostable. Make sure you throw it in the right bin (the compost bin) when you leave! If you set it on the dish return, our staff will take care of it. The Hokie Hi Picnic this year will be Zero Waste which means that all to-go ware will be either compostable or recyclable. This event is designated to be a Virginia Green Event and will reduce the amount of trash going to the landfill drastically. Stay tuned for news on potentially transitioning away from foam to-go containers sometime this coming academic year! Since 2009, VT Dining Services has diverted more than 2100 tons of waste from the landfill through our composting program. Eventually, some of the finished compost goes back to the farm to be used to enrich our soil and close the loop. Well, the craziness of the last few weeks of the semester and graduation have come and gone and it is officially SUMMER in Blacksburg! Woohoo! Even though all our students are gone, summer is probably one of the busiest times of the year for Sustainable Dining at VT. 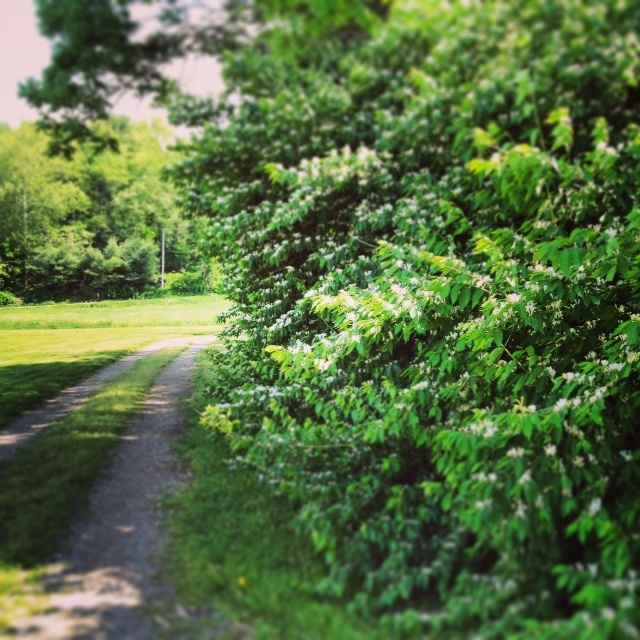 The farm is kicking it into high gear and there are plenty of projects to get ready for August. Soon enough, we’ll be moving the incoming freshmen into dorms, picking apples, and cheering onVT Football. What are YOU doing this summer? Keep in touch! Visit us @VTGreenDining on Twitter & Instagram! So what have we been up to so far this summer? Take a look at what we’ve been working on in the last few weeks: The building of our new Hoop House! Hoop Houses are structures that are used to extend the season. The house provides just enough cover that it keeps the ground and air warm enough to continue growing into the winter. We’re starting out planting tomatoes and basil in the Hoop House this summer. In the winter, we’ll use the Hoop House to grow salad greens for the Dining Units! While we’re talking about the farm, there have been a few requests for volunteer hours at the farm. We currently do not have any scheduled volunteer hours, however, you’re welcome to join our crew during the week. The crew works Monday – Friday from 7 AM – 3:30. Email sustainabledining@vt.edu or message us on facebook to let us know when you’d like to come down. Please get in touch with us before coming down so that we can be ready for you! The Sustainable Food Corps at VT also is working on a farm this summer and could use some help. They meet on Wednesdays at 6:30 PM and Sundays at 10 AM at their farm behind Smithfield Plantation. Stay tuned for more updates throughout the summer!